Ronnie Corbett: Good evening! It's wonderful to be back with you again, isn't it, Ronnie? Ronnie Barker: Indeed it is. And in a packed programme tonight, I shall be having a word with a man who goes in for meditation, because he thinks it's better than sitting around doing nothing. Ronnie Corbett: And we'll be talking to a car designer who's crossed Toyota with Quasimodo and come up with The Hatchback of Notre Dame. For sixteen years, big Ronnie Barker and little Ronnie Corbett hit hard on the nation's funny bone with their gently subversive, often wonderfully rude comedy routines, which lampooned countless aspects of British life - pompous authority figures, eccentric middle class guests at dreary cocktail parties, shabby men (with distinctly surreal private lives) putting the world to rights over a beer or ten, ghastly restaurants with rude waiters and incompetent chefs, bumptious politicians, leery rock stars and deeply suspicious doctors. Although often regarded as a "safe" series, The Two Ronnies' best sketches often strayed toward decidedly bizarre and ridiculous Monty Python territory, which isn't surprising as several of the Pythons (together with genius upstarts like Marshall and Renwick) wrote for the series - that's when the great Ronnie Barker wasn't providing the bulk of the material himself under a number of unlikely pseudonyms! (Remember Gerald Wiley? That was him.) The musical numbers can seem dated to modern eyes, but the country and western parodies from 'Big Jim Jehosophat'(Corbett) and 'Fatbelly Jones'(Barker) were always a joy, wrapping dozens of double-entendres around some genuinely catchy tunes, as were the lesser-seen spoofs of Chas and Dave, Status Quo and even Kid Creole and the Coconuts! 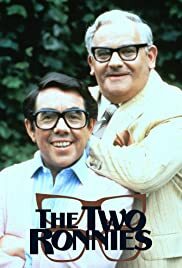 As with many of the 'old school' comedians, the Two Ronnies' work has endured far better than many of the 'alternative' comedians who tried to push them aside - not only that, they're still being repeated. So where's Ben Elton now?